Unparalleled Reputation – NGC was founded in 1987 and is one of the nation’s oldest and most respected coin certification companies. 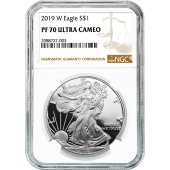 You can be confident that NGC-certified silver eagles are authentic and properly graded. Excellent Quality – MS-69 silver eagles carry only one or two minor surface imperfections and MS-70 specimens are technically “perfect” or numismatically flawless. Incredible Liquidity – American Silver Eagles are recognized around the world and are therefore easy to liquidate. US Government Backing – Silver Eagles are minted by the United States Mint and have the full faith and backing of the U.S. government. Real Wealth – Physical silver is insurance against inflation and international tragedy. Real silver is real wealth, and few sensations compare to holding genuine silver in your hands. If you’re seeking MS-69 or MS-70 NGC American Silver Eagles, then you’re already expressing your desire for the best. But when you choose Universal Coin & Bullion, you can enjoy the best of the best. Our team of experts is led by Dr. Michael Fuljenz, who proudly serves as “America’s Gold Expert” and has appeared on Fox Business News, Bloomberg TV, and CNBC. Dr. Fuljenz understands what quality is, and that’s why he chooses only the best NGC MS-69 and MS-70 silver eagles for our inventory. Dr. Fuljenz was an authenticator and grader for a leading grading service. MS-69 silver eagles are ideal for investors who want an affordable, yet high-quality example of the beautiful American Silver Eagle, which features the critically acclaimed Walking Liberty design on the obverse (or “head’s side”) and heraldic eagle on the reverse (“tail’s side”). MS-69 specimens typically have just one or two minor surfaces flaws. MS-70 silver eagles are considered technically “perfect” in the numismatic sense. MS-70 silver eagles are more expensive than MS-69 specimens, but coins in either grade makes tremendous – and patriotic – additions to any bullion portfolio or collection. Whether you buy MS-69 or MS-70 silver eagles, you can rest assured they will be shipped in secure, discreet packaging. Online orders over $99 qualify for free shipping to help you maximize your investment dollars. We’ll ensure you’re completely satisfied with your silver eagles and will not consider the order complete until you’re 100% happy with the products and service you’ve received from us. No wonder we have earned and maintain an A+ rating with the Better Business Bureau! 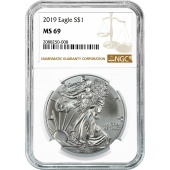 For more information about our NGC MS-69 and MS-70 silver eagles, please call us today toll-free at 800.822.4653. Silver prices move quickly, so order today before prices increase again. Many consider the American Silver Eagle as the nation’s modern silver dollar. Silver eagles are a contemporary take on the classic Morgan dollars made during the days of Old West gun slinging, action-packed saloons, and endless opportunities on the untamed frontier. American Silver Eagles were born during the presidency of a classic American figure – President Ronald Reagan. In 1985, President Reagan signed into law legislation that instituted the American Eagle bullion coin program, which authorizes both the silver and gold American Eagle coins. American Silver Eagles – the coin whose silver dollar roots trace back through yesteryear and symbolizes a lasting legacy of “The Gipper” himself. The gorgeous design on the American Silver Eagle was originally designed in 1916 by Adolph A. Weinman and appeared on the half dollar for another 31 years, until 1947. Some 39 years later, in 1986, the United States Mint resurrected the patriotic design a few minute enhancements. Sculptor-Engraver John Mercanti, who later served as the U.S. Mint’s chief engraver, helped prepare the coin for production, also designing the coin’s heraldic eagle on the reverse. Aside from some minor design modifications throughout the years and a one-year special edge inscription for the 30th anniversary of the series in 2016, American Silver Eagles remain virtually unchanged from their appearance during the Reagan era in 1986. For this and many other reasons, the silver eagle has enjoyed crossover collectible appeal among collectors and is a staple for bullion investment portfolios the world over.